The November 24th issue of The Economist, page 73, is running a new full-page color ad for “The Making of Modern Economics.” Here is the ad. It is a supreme pleasure to give the first Adam Smith Lecture in this newly refurbished Panmure House here in Edinburgh, Scotland, the home where Adam Smith lived for the final dozen years of his life as he served as the Commissioner of Customs. It was here that Smith produced four editions of his famous work, The Wealth of Nations. I wish to thank Professor Keith Lumsden and everyone at the Edinburgh School of Business involved in this important project for inviting me to speak on this special occasion. 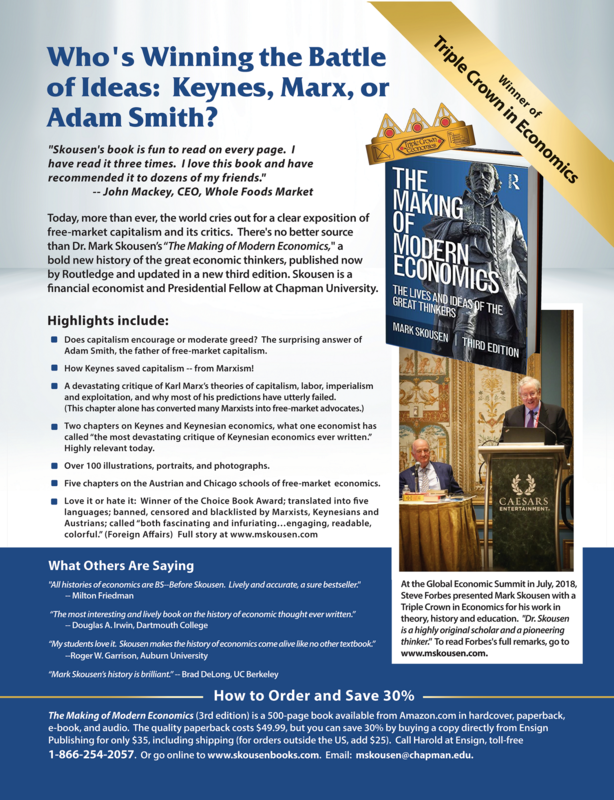 I wish to take this opportunity to talk about my own sojourn in which I made Adam Smith and his system of natural liberty the heroic figure in my book, The Making of Modern Economics, and the contributions I have made in the history of economic thought. 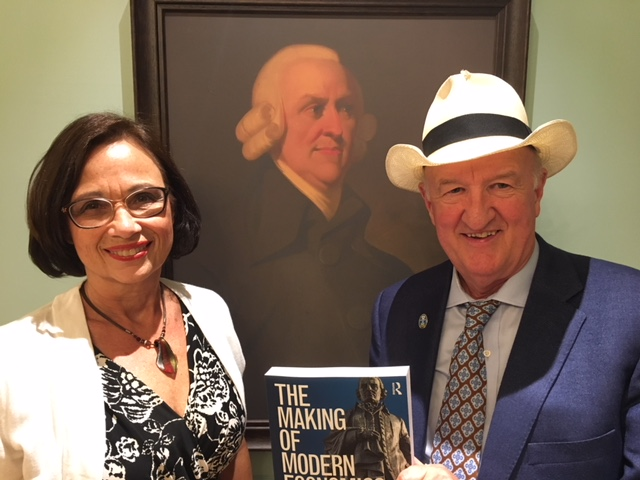 My wife Jo Ann and I at the Panmure House in front of portrait of Adam Smith on September 24, 2018. First, The Making of Modern Economics: Lives and Ideas of the Great Economic Thinkers is the first one-volume history of economics written from a market-friendly perspective. Until its publication, almost all other histories of thought were written by socialists, Keynesians and Marxists. Second, my book applies an alternative to the traditional pendulum “left-right” approach to the political spectrum — a totem pole of economics, where economic thinkers are ranked from top to bottom. Third, my work creates for the first time a real story line in the history of economics, with a primary protagonist; a cunning plot where the hero faces his enemies and is sometimes left for dead, only to be rescued by his friends; and a happy ending. The running storyline is Adam Smith’s “system of natural liberty,” where every economist is measured to the extent they support or add to the house that Adam Smith built, or are critics who want to tear down and replace Smith’s model with their own. To explain how this new pedagogy came about, let me tell my own story about how The Making of Modern Economics came into being. The genesis of my work goes back to 1980, when I commissioned the libertarian economist Murray Rothbard to write a free-market alternative to the bestselling book, The Worldly Philosophers, by the late Robert Heilbroner. No better title has been found for the “lives and ideas of the great economic thinkers” from Adam Smith on. Heilbroner’s little book has been immensely popular, for both students and laymen, having sold over four million copies. Unfortunately, Heilbroner was a socialist whose favorite economists were Karl Marx, Thorstein Veblen, and John Maynard Keynes. He ignored the ideas of the French laissez faire school of J. B. Say and Frederic Bastiat; the Austrian school of Ludwig von Mises and Friedrich Hayek; and the monetarist school of Irving Fisher and Milton Friedman. In fact, he didn’t even mention Milton Friedman’s name in the latest edition. The reader deserved a more balanced approach. I also found the way the history of economics was taught in college to be frustrating. One of the most disappointing classes I took as an undergraduate was in the history of economic ideas. The course was convoluted, the text was dry (with few anecdotes and no pictures), the lives of economists seemed uninteresting, and even the A students came away from the class wondering whether economists made any sense at all. Typically students in economics were exposed to a wide range of schools of thought — neoclassical, Keynesian, monetarist, Austrian, supply side, institutionalist, and Marxist — without any effort to determine the veracity of their theories. In sum, the story of economics was told in a haphazard and disjointed way. In a sense, there was no story at all. There was no running plot, no engaging drama, and no single heroic figure. Economists came and went on the pages of history, with no sense that the science was advancing or regressing. In my readings of the histories of economic philosophy, they all lacked a running storyline, and a consistent point of view that allows the student to realize when an academic scribbler was heading down the wrong road, or off a cliff. For years, I searched for a new approach. I asked some of my friends who I should approach to write a contra-Heilbroner history. Larry Wimmer, my mentor at BYU, suggested George Stigler, the Chicago economist, but I worried about his biting sarcasm and his criticism of the Austrian school. I considered Murray Rothbard, the iconoclastic Austrian economist, to be a better choice. One day in 1980 I called him on the telephone and asked him what he thought about the idea of writing a contra-Heilbroner history of thought. He was enthusiastic and loved the idea, saying that he always wanted to write a libertarian version. So we readily agreed, and I paid him a handsome advance of $20,000, so that he would concentrate on this work among his many other projects. He promised that he would deliver a 12-chapter history in 12 months, and the book would not go beyond 300 pages, the same length as Heilbroner’s. One year passed. Two years. Three years. No completed manuscript. No 300 pages. No layman’s discourse. No Adam Smith. Murray was writing all right, but he was not writing a Heilbroner bestseller for the general public. He was writing and researching what we call a Schumpeterian tome for graduate students: a multi-volume, dense history of economic thought for professionals and advanced students. In the 1940s, Joseph Schumpeter, the Austrian economist and iconoclastic Harvard professor, wrote his voluminous History of Economic Analysis, which reached 1,260 pages by the time it was published. Rothbard’s laborious work began with Aristotle and the Greeks, moving slowly along to the Catholic Fathers and the Enlightenment, and finally, by chapter 16, reaching the celebrated Adam Smith. I was an admirer of Murray Rothbard as a libertarian economist and radical historian, but I could see that this was not what I had bargained for. Years later, after tiring of asking the question, “Have you reached Marx yet?” I sent Murray a copy of a Harvard Crimson interview with Joseph Schumpeter, who said in 1944, “My research program grows longer and my life shorter. My History of Economic Analysis drags, and I am always hunting other hares.” Rothbard was apparently following the same path. 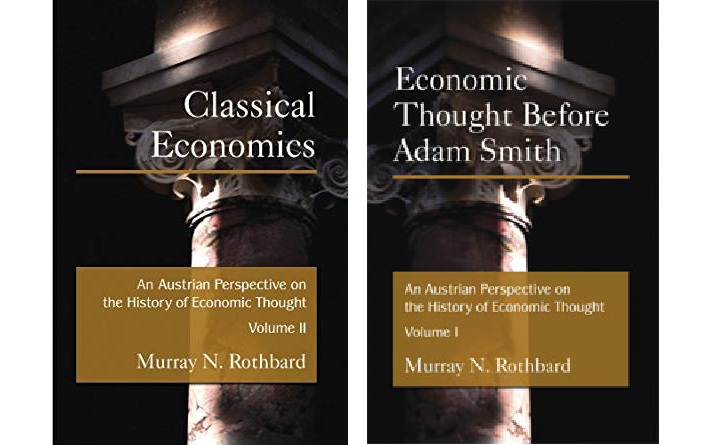 Fifteen years later — 1995 — Edward Elgar (the publisher, not the composer) published the first two volumes of Rothbard’s history, “Economic Thought Before Adam Smith” (556 pages) and “Classical Economics” (528 pages). Rothbard’s first volume ends with his famous (and critical) chapter on Adam Smith; and his second volume ends with his chapter on Karl Marx. I have enjoyed reading Rothbard’s stimulating and often cutting remarks, and agree with much of what he wrote (with the strong exception of his attack on Adam Smith). But he never finished the job. I frequently commented to friends that Murray was writing a Schumpeterian tome, which also meant that he would probably die before completing the book. After Schumpeter’s death in 1950, his devoted wife, Elizabeth, tried to get the almost finished manuscript ready for publication. She also passed away before completing the task, and the manuscript was prepared for publication by Harvard colleagues, and published by Oxford University Press in 1954. Sadly, my concern became prophetic. Murray Rothbard died of a heart attack in New York City in January 1995, at the age of 69, only a few weeks before the first copies of his two-volume work appeared (I believe I was the first person to be receive the two volumes in the mail). He never got to the next two planned volumes. After Murray’s unexpected passing, I realized that the contra-Heilbroner work had yet to be written. Like other libertarians, I admired most of Murray Rothbard’s contribution, but it wasn’t a Heilbroner alternative. It was a Schumpeter alternative. 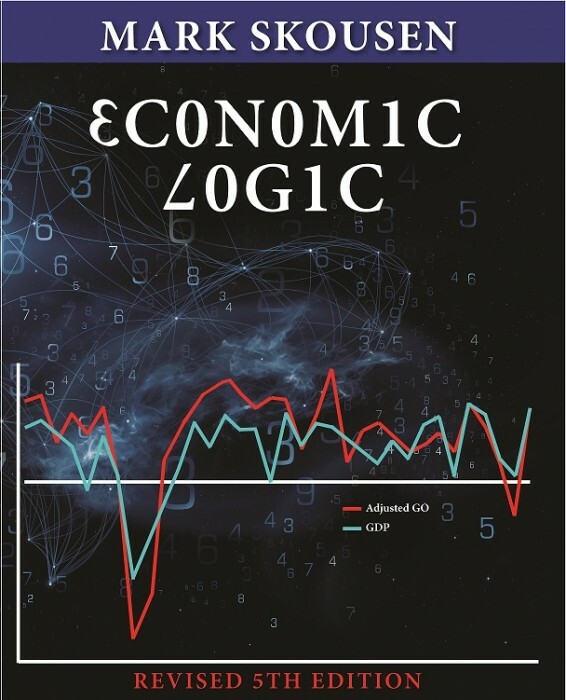 I finally came to the conclusion that perhaps I myself had prepared sufficiently to write the first one-volume history of economics from a free-market perspective. In the 1980s I had written my work The Structure of Production, a treatise on Austrian macroeconomics, that was both historical and theoretical. It was published in 1990 by New York University Press. Then in 1991, I came out with Economics on Trial, a review of the top-ten textbooks in economics, which included studies of all the major schools of thought, and a year later an edited volume, Dissent on Keynes. So I began writing my first chapter entitled “It All Started with Adam” (Adam Smith, that is). At the time, I was still heavily under the influence of Rothbard, so my first chapter was largely a negative assessment of Adam Smith. Rothbard held the unconventional view that Smith apostatized from the sound doctrines and theories previously developed by pre-Adamites such as Richard Cantillon, Anne Robert Turgot, and the Spanish scholastics. He asserted that Adam Smith’s contributions were “dubious” at best, that “he originated nothing that was true, and that whatever he originated was wrong,” and that The Wealth of Nations was “rife with vagueness, ambiguity and deep inner contradictions.” Specifically, his doctrine of value was an “unmitigated disaster”; his theory of distribution was “disastrous”; his emphasis on the long run was a “tragic detour”; and Smith’s putative “sins” include support for progressive taxation, fractional reserve banking, usury laws, and a crude labor theory of value that Marxists later borrowed from Adam Smith and David Ricardo. At the time my assessment of Adam Smith followed similar lines. I didn’t feel completely comfortable with this first chapter, but I was on my way. There was only one way to find out. 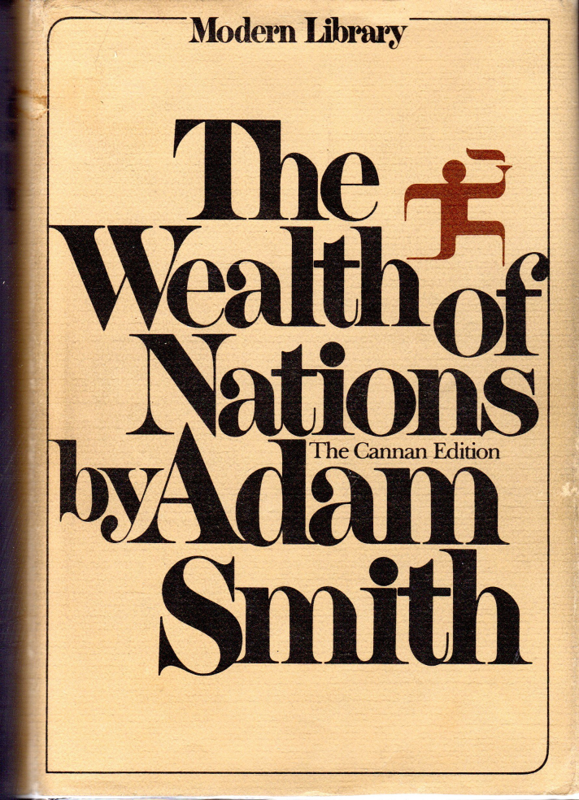 I decided to read Adam Smith’s magnum opus, The Wealth of Nations, cover to cover, and decide for myself. So for the next two months I read day after day all 975 pages of The Wealth of Nations. (I still have that well-marked Modern Library edition on my bookshelf.) Two months later, I put the book down, and concluded without any doubt: Murray Rothbard is wrong and my Uncle Cleon, and Ludwig von Mises, are right. Adam Smith’s “system of natural liberty” and The Wealth of Nations, despite its sometime significant errors, are an inspiring and profound work that deserves to be the central message of the book. By establishing an heroic figure in the development of economics, I found that it was possible to judge all economic characters on the stage of ideas. The first chapter begins with Adam Smith, the heroic figure, and thereafter economists are ranked to the extent that they promoted or detracted from Smith’s “system of natural liberty.” Thus, Karl Marx, Thorstein Veblen, John Maynard Keynes, Joseph Stiglitz, and even some of Smith’s disciples such as Robert Malthus and David Ricardo undermined the Smithian model of democratic capitalism during periods of economic failure and upheaval, while J. B. Say, Carl Menger, Alfred Marshall, Irving Fisher, Ludwig von Mises, and Milton Friedman, among others, remodeled and improved upon Smithian economics as the world economy recovered and prospered. My history unfolded as Smith and his system of natural liberty came under frequent attack, such as during the Industrial Revolution, and were sometimes left for dead, such as in the Great Depression, but were always resuscitated and reinvigorated by supporters. The collapse of the Soviet socialist central planning model in 1989-92 represented a triumph of the Adam Smith model. Thus, the story of economics had a good ending (albeit muddied by the financial crisis of 2008). To summarize, all previous histories of economic ideas tended to give a dry, disjointed, and helter-skelter account of economists and their contradictory theories. But The Making of Modern Economics unifies the story of economics for the first time by ranking all major economic thinkers either for or against the invisible hand doctrine of Adam Smith. Thus, Marx, Veblen and Keynes are viewed as critics of Smith’s doctrine, while Marshall, Hayek and Friedman are seen as defenders. Using this ranking system, Making offers a full-scale review and critique of every major school and their theories, including classical, Keynesian, monetary, Austrian, institutionalist, and Marxist. There are some other contributions I made in writing The Making of Modern Economics. First, I reject the standard political spectrum, what I call the “pendulum” approach to labeling economists. In the world of competing ideologies, the standard political spectrum has Adam Smith, advocate of laissez faire, on the extreme right; Karl Marx, the radical socialist on the extreme left; and John Maynard Keynes, supporter of big government, in the middle. This pendulum approach is unsatisfactory since it equates Adam Smith with the extremism of Karl Marx and represents Keynes as the golden mean or the middle ground. 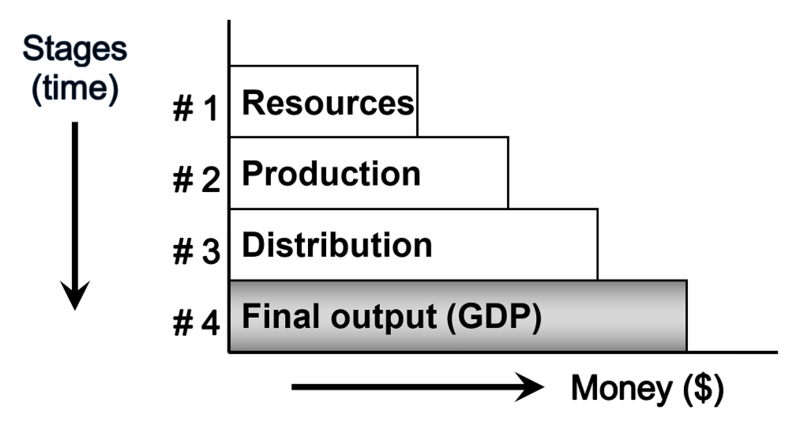 In the introduction to The Making of Modern Economics (and The Big Three in Economics, a shortened popularized version I wrote in 2007), I offered an alternative by creating the “Totem Pole of Economics,” where economists and their theories are measured by their impact on economic freedom and growth. In this ranking, Adam Smith is on top, followed by Keynes, and Marx is “low man” on the Totem Pole of Economics. 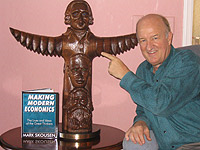 After the book was published, I commissioned a Florida woodcarver, James Sagui, to carve the totem pole of economics, which now stands in my living room in my house in New York. Second, I added some important new figures in the history of economics. I devoted a whole chapter (2) to the French laissez faire school, with major sections on J. B. Say and Say’s law of markets; Frederic Bastiat; and Alex de Tocqueville (who had a surprising lot to say about economic ideas and behavior in his Democracy in America). I am also happy with how Chapter 9, “Go West, Young Man: Americans Solve the Distribution Problem in Economics,” turned out, where I was able to find singular American economists who advanced the development of the factors of production — Henry George on land, John Bates Clark on labor, and Frank Fetter on capital. Especially novel, I think, is chapter 10, in the middle of the book. It is entitled “The Conspicuous Veblen vs. the Protesting Weber: Two Critics Debate the Meaning of Capitalism.” It follows the success of the marginalist revolution that advanced the Adam Smith model and established “neo-classical” economics as a formal science. Heilbroner and other historians highlighted the sociology of Thorstein Veblen, a major American critic of “neo-classical” economics without providing a counterweight. My middle chapter juxtaposes the ingenious work of Max Weber, the German sociologist who offered a spirited defense of “rational” capitalism. The two sociologists Veblen and Weber served as a perfect counterbalance. When I finished the manuscript, I submitted it to several publishers. M. E. Sharpe of New York was a surprising choice, because they are well-known to be publishers of radical works by Marxists, socialists, and social democrats. Why would they be interested in publishing a book by a free-market libertarian? Sean Culhane, my editor at ME Sharpe, told me frankly, “Because after the collapse of the Soviet model radical books don’t sell like they used to.” I also believed that having the book being published by a non-conservative/non-libertarian publisher would be a good way to get exposure to a wider audience of students, teachers, and readers. Every book has a “pub date,” as they call it in the media — the official release date for a book. Mine is special. The manuscript took longer than expected to get published, and went through numerous editing processes and reviews by anonymous referees assigned by the publisher. Finally, the book came out with the official pub date of March 8, 2001. For some reason, March 8 sounded familiar, but I couldn’t put my finger on it. Then it dawned on me: March 8 is the day in 1776 that The Wealth of Nations was published in London! Most books are dedicated to an individual, and in my case, I felt that the catalyst behind the work was my uncle W. Cleon Skousen. So I dedicated the book to him. Mike Sharpe, the publisher and a social democrat, asserted that my work will eventually replace Robert Heilbroner’s The Worldly Philosophers as the most popular history of thought in the classroom. If only! I was most worried about the reaction of Mark Blaug, the premier historian and author of the classic work, “Economic Theory in Retrospect.” In a handwritten letter, he began by saying that I probably wouldn’t like what he had to say, but then went on to state that the author “tells a story rarely told….I find the book extreme, but is unputdownable — try it and see.” I believe he created a new word for my book. 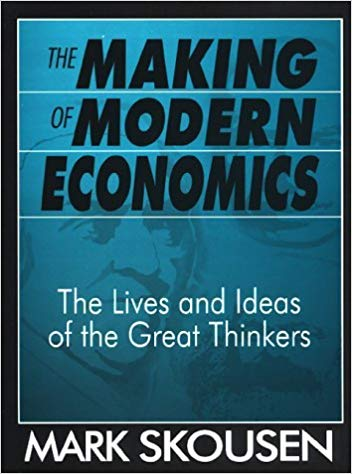 The first edition of The Making of Modern Economics was never reviewed by any of the major academic journals, including the journals that specialize in history of thought, such as the History of Political Economy (HOPE) and the History of Economics Society. Nor was it reviewed, to my knowledge, by any free-market journals, such as the Quarterly Journal of Austrian Economics (published by the Mises Institute) or Review of Austrian Economics (edited by Peter Boettke at George Mason University), even though the text had three chapters on Austrian economists, and was a bold new approach to the history of thought. And in 2009 the American Library Association gave the 2nd edition of my work the Choice Book Award for Academic Excellence. Least the reader think I’m only cherry picking the good reviews, let me now mention the mixed and negative review. After the first edition came out, it was attacked by Marxists, Keynesians and even a few Austrians. It was pulled from the library shelves of the University of Philippines, a hotbed of Marxism; censored by Keynesians at Columbia University; and blacklisted at the Mises Institute. David Gordon, editor of The Mises Review, also gave it a mixed review. “Though the book reads well, I find myself compelled to issue a warning. The book is a disaster.” I suspect that Gordon was not happy that I made Adam Smith the hero of the book. I also gave high marks to Milton Friedman for advancing free-market economics in the 20th century. Under the influence of Rothbard, the Mises Institute was highly critical of both Adam Smith and the Chicago school of Friedman. I’m sure David Gordon and other members of the Mises Institute would be surprised to learn that Ludwig von Mises himself was a big fan of Adam Smith. The Chinese translation also had trouble with chapter 6 on Marx. When I received a copy of the Chinese translation, I asked a Chinese economist to tell me if the chapter title was positive or negative. “Oh, very positive,” he said. “It says ‘Karl Marx and Classical Economics’” — a far cry from the actual title, “Marx Madness Plunges Economics into a New Dark Age”! However, the Chinese economist told me that the rest of the chapter was accurately translated. 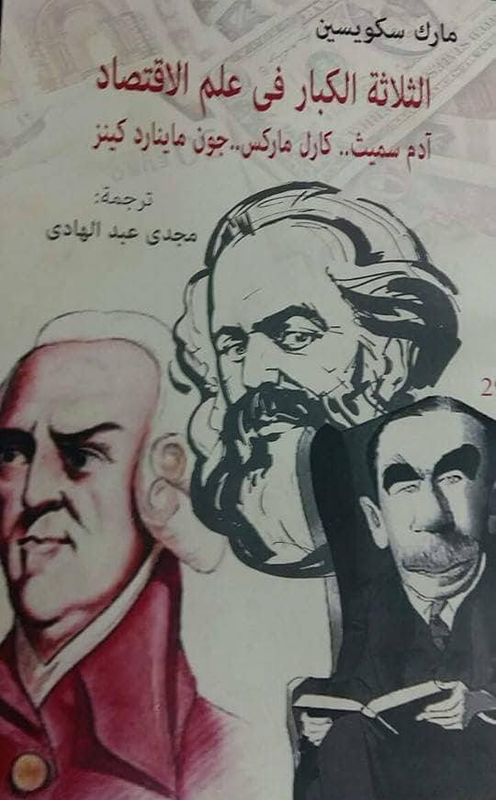 The latest translation (actually “The Big Three in Economics”) is in Arabic. 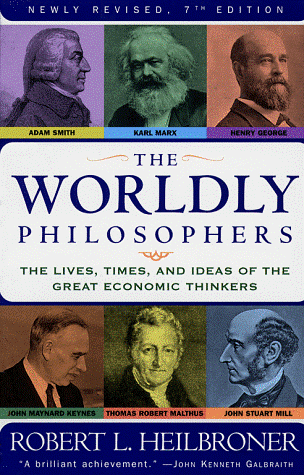 The designer of the cover must not have read the book, because the artist has Marx dominating Smith and Keynes. My history of economics even landed me a position at Columbia University. 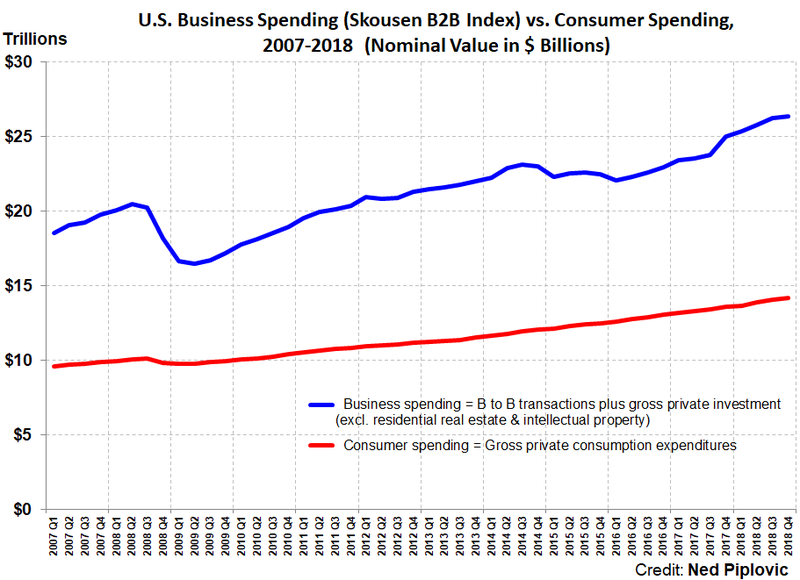 Here’s the story: When I was president of the Foundation for Economic Education (FEE) in 2001-02, I contacted William F. Buckley, Jr., the founder of National Review and a friend, to see if we could get together. We decided on lunch at his home in Stamford, Connecticut, in the Spring of 2002. My wife joined me and we had a delightful time as he gave us a tour of his waterfront home. After lunch, he showed us his home office located in his garage, including an entire shelf of Buckley books. He said I could pick any book on the shelf and he would autograph it. I chose one of his sailing books, all of which I had read. Almost as an afterthought, I gave him in turn a copy of The Making of Modern Economics, and we left. I didn’t think anything of it until a month later a review of the book appeared in National Review. It was totally unexpected. Buckley wrote that he loved the book and thought it would make an excellent gift to college students. A few weeks later I received a telephone call from John Whitney, a veteran business leader and popular professor at the Columbia Business School. He specialized in turnarounds. He said that based on Buckley’s review, he had bought and read my book and liked it so much he wanted to meet me. After we had lunch, he invited me to give a guest lecture at Columbia Business School. I was intimidated but he and the students liked my presentation so much that he told me, “Mark, I’ve decided to retire from Columbia and I’d like you to take my place.” I was honored, and so the process began. I had Milton Friedman write a letter of recommendation to the dean, and Professor Whitney finally convinced the Keynesian chair of the department, Ray Horton, to give me a try. I taught economics at Columbia in 2004-05, all thanks to John Whitney…and Bill Buckley. In the business course, I used The Making of Modern Economics but the department chairman saw my free-market history as a threat to a similar class he taught, “Modern Political Economy,” and my course was summarily discontinued. The second edition won the Choice Book Award for Outstanding Academic Title, and has gone on to become a popular history of thought textbook, now rivaling Heilbroner’s The Worldly Philosophers. It has been translated into six languages–Spanish, Turkish, Mongolian, Polish, Arabic, and Chinese (twice). When M. E. Sharpe was bought out by Routledge Publishers in late 2014, the Routledge editors thought it appropriate to update the MME with a third edition. 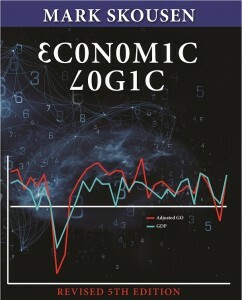 New sections were added on the “Invisible Hand, Central or Marginal?”, liberation theology, and a major rewrite of the final chapter 17 with new sections on the financial crisis of 2008-09, inequality, the “austerity vs. stimulus” debate, market imperfections, and “Hayek vs. Keynes Redux” and breakthroughs in market design and other microeconomic contributions. Appropriately, the new statue of Adam Smith, located on High Street in Edinburgh, graces the cover of the third edition, a fitting tribute to the father of modern economics. 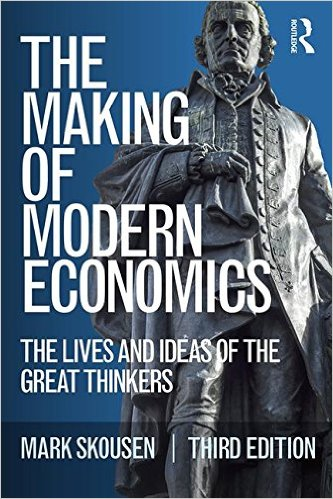 A qualify paperback third edition of The Making of Modern Economics: The Lives and Ideas of the Great Thinkers, published by Routledge, is now available at a substantial discount. The retail price by the publisher and Amazon is $45.99, but you pay only $35 postpaid if you order through Ensign Publishing, toll-free 1-866-254-2057. The Making of Modern Economics is also available on Kindle, or audio book, at Amazon.com. The possible exception is The Roots of Capitalism, by John Chamberlain (1965), now out of print. For more information, see my paper, “The Centrality of the Invisible Hand,” presented on January 31, 2012, at Hillsdale College. 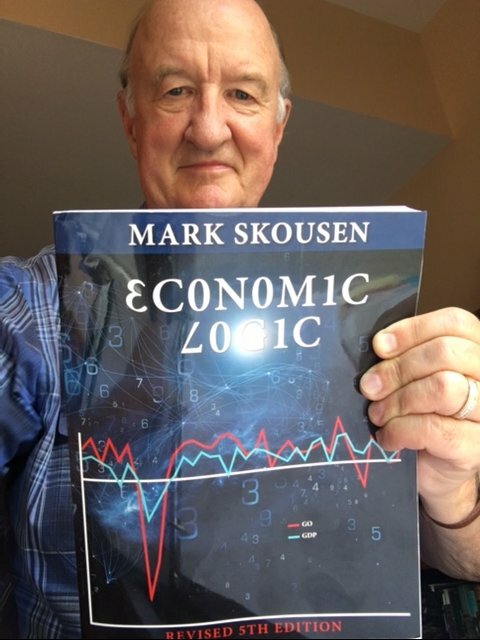 Mark Skousen is a professional economist, author and teacher. He is a Presidential Fellow at Chapman University. In 2018 he was awarded the Triple Crown in Economics for his work in theory, history and education. Since 1980, he has been editor of Forecasts & Strategies, an award-winning financial newsletter. He is also the producer of FreedomFest, “the world’s largest gathering of free minds,” held every July in Las Vegas (www.freedomfest.com). For more information, go to www.mskousen.com or www.markskousen.com. 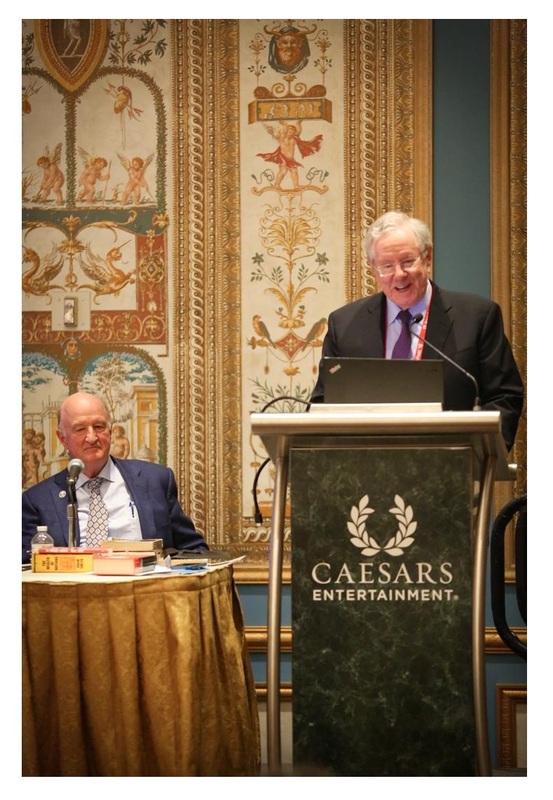 The following are Mr. Forbes remarks following Skousen’s session on “Adam Smith, Marx and Keynes: Who’s Winning the Battle of Ideas?” on Wednesday, July 11, 2018, at the Global Economic Summit, FreedomFest, Paris Resort, Las Vegas. Who’s winning the battle of ideas? Well, Mark Skousen is winning the battle of ideas. But among past economists, I think Joseph Schumpeter, the 20th century Austrian economist, is winning the war of ideas. Smith, Marx and Keynes all believed in various ways in what you might call an equilibrium, that the economy is a steady state and you get disruptions from time to time, whether wars, earthquakes or new inventions. You get some turmoil and then things settle down and you have an equilibrium, which is why even John Stuart Mill became a socialist (not because of the influence of his young wife). He couldn’t understand the role of profit. Even Adam Smith did not understand the role of profit. 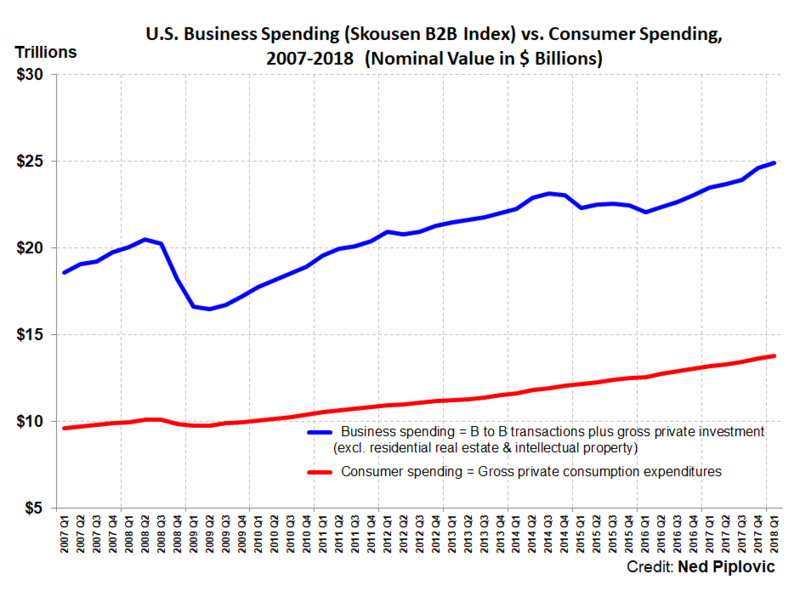 If you have an economy where you are striving for a perfectly competition equilibrium, there is no role for profit, other than as a bribe for entrepreneurs to do things. Schumpeter was an infidel, in the words of Peter Drucker. That is, he saw profit as a cost of doing business, as a moral force. Why? Because in his mind the economy is always dynamic. 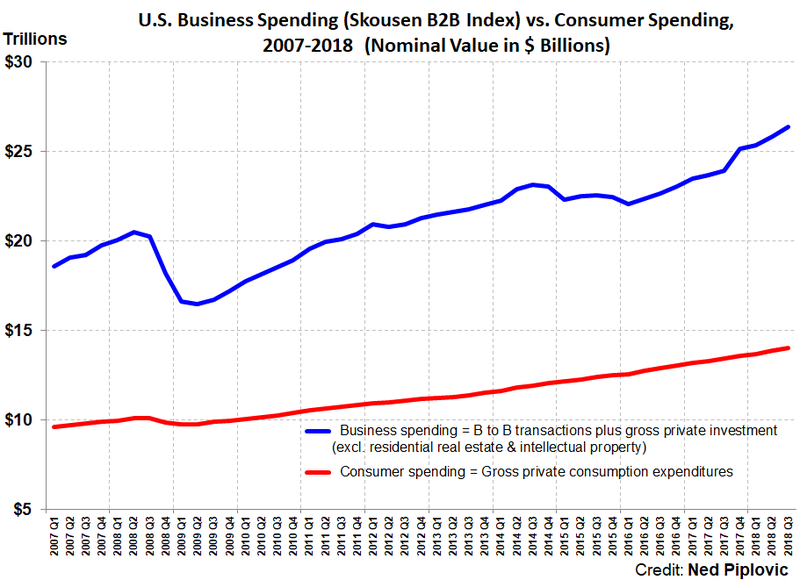 A free market is dynamic, always changing, what he called creative destruction. You focus on the creative side. But it’s also destroying, which means it’s destroying capital and you have to replace that destroyed capital with new capital. Also, how does an economy advance? It advances with new knowledge. Where does knowledge come from? Through constant experimentation by entrepreneurs in the marketplace. Look at Silicon Valley. Look at Peter Thiel. He says eight out of ten ventures, even with great brains like his, will fail. Only two out of ten, maybe one out of ten, will really be successful. So, profit is essential if you’re going to have a growing economy. To replace the destroyed capital here’s one little example. I’m not a fan of the New York Times, but decades ago they bought the Boston Globe, and a few other papers in Massachusetts, for $1.2 billion. About 20 years later they ended up selling it for about $50 or 60 million, depending on whose numbers you want to believe. Over a billion dollars of capital were destroyed. And you have to replace this capital with new ventures. So, in Schumpeter’s mind, profit was a cost of doing business in a dynamic, free economy. His worry was not taking wages from laborers, but too not enough profit. It was essential to grow and have a dynamic economy – to create the means to make it possible, to nurture it, to replace what was destroyed and to finance what is new. So, I vote for Schumpeter. But, among the big three (Smith, Marx and Keynes), it must be pointed out that Adam Smith was a moralist. He understood, as Mark does, that economics is people. He saw the economy not just a creator of wealth, but as a moral force, which too many of all these equations we have in economics today ignore. Which gets to the 50-page encomium that Professor Ken Schoolland wrote for Mark’s award. Ken is also quite a fellow. You may know that he wrote The Adventures of Jonathan Gullible: A Free Market Odyssey, which is translated in over fifty languages. Maybe we can get one to the White House and to trade representatives! But, Mark, as you know, is an amazing individual. He’s a highly accomplished economist and in a normal, non-political environment, he and a handful of others would have already won the Nobel Prize for economics. But, given the political environment we have today, that’s not going to happen right now. Maybe in the future. He is a superb and highly original scholar. Just look at his textbook Economic Logic, now in its 5th edition, which demonstrates Mark’s ability to look at the whole economy, the real world and real people. This rigidity between micro- and macroeconomics is not for him. He realizes they’re all connected together. He began this book with a profit-loss income statement to demonstrate the dynamics of the real-world economy. No other textbook does that. He gets it. And extraordinarily, Mark’s book brings in many other disciplines to teach lessons of economics, underscoring crucial lesson, whether it is history, sociology, finance business or marketing management. He recognizes that this rigidity may be nice for departments created at universities. But, in the real world, it does not advance learning. They are need to be combined together. In that sense, he goes back 200 years to before mathematicians took over economics. His output is voluminous, with numerous books and articles. And, what is so unusual, is that he combines mastery of math-laden fields with the ability to write clearly and directly in a manner that would have elicited cheers from Ernest Hemingway. Imagine, he gets to the point. So, you won’t win an economic argument with Mark by trying to outdo him with regression analysis, graphs and comprehensible equation. He’ll hit you right back. He’s master of that. But, he’s unique with his fascination with history, with flesh and blood individuals. Read his concise and incisive sketches of numerous economists in “The Making of Modern Economics.” He brings history to life. People are interested in people. He recognizes that stories are highly instructive. And, this is very fascinating: Mark is a genuine heir to Ben Franklin, a direct descendant. And he apparently inherited Franklin’s genes of versatility and range of interests. He’s also, among other things, a talented thespian. Taught by his wife, but he learned very quickly. And, one of Mark’s other greatest achievements is finishing Franklin’s autobiography. Franklin stopped writing his autobiography in 1757 at the age of 51. But, the most interesting part of his life happened in the next 30 years, including the Constitutional Convention, his diplomacy in France, where he put on the coonskin cap to show that he’s a frontiersman. He was actually a very sophisticated scientist. But, he played to the images of Americans in the French court. He knew how to seduce diplomats and others, and played a crucial role in the French alliance, which gave us the wherewithal to win the revolution. But Mark, with his help of his wife Jo Ann as editor, finished his autobiography, and they did so by using Franklin’s own words from speeches, pamphlets, books, Poor Richard’s Almanack, newspaper articles – a dazzling achievement. In this sense, this book surpasses the work of 99% of today’s professional historians in terms of audacity, originality and adherence to the truth. In short, Mark is an outstanding historian, as well as an economist. He’s a pioneering thinker. This is what I think he’s a really going to be noted for. He’s pushing the concept of the gross output. I prefer the acronym GO. What does GO mean? 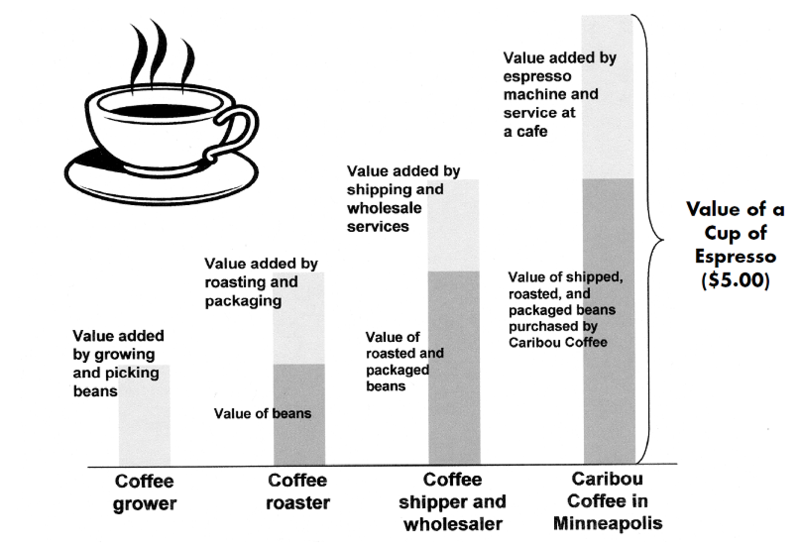 It’s a more comprehensive way to measure the economy at all stages of production. GO is a better way than GDP to take a picture of our economy. It’s like the difference between an x-ray and an MRI. GDP is the x-ray; GO is the MRI. The GDP is like looking at a carton of milk in the supermarket and ignoring all the cows that you had to raise, and pasteurize the milk, then bottle the milk and deliver the milk. 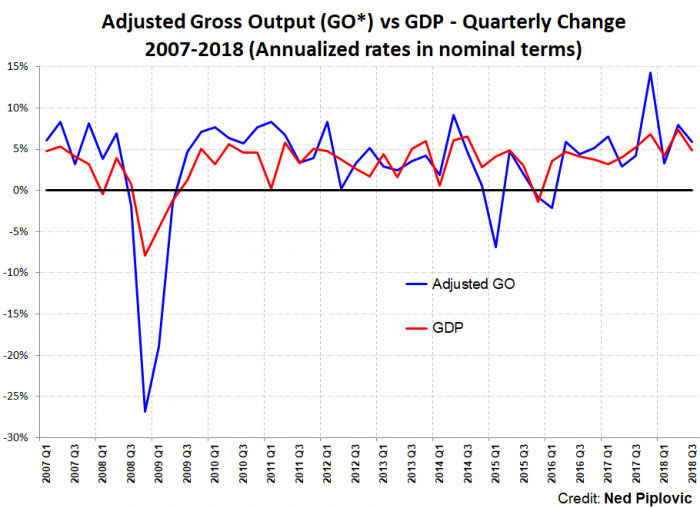 GDP gives you a very incomplete picture. It’s just final output. Alone it’s misleading and that’s why you read time and time again, GDP shows that 70% of the economy is consumption. That is absolute nonsense. What makes consumption possible is people’s income, which comes from investment. 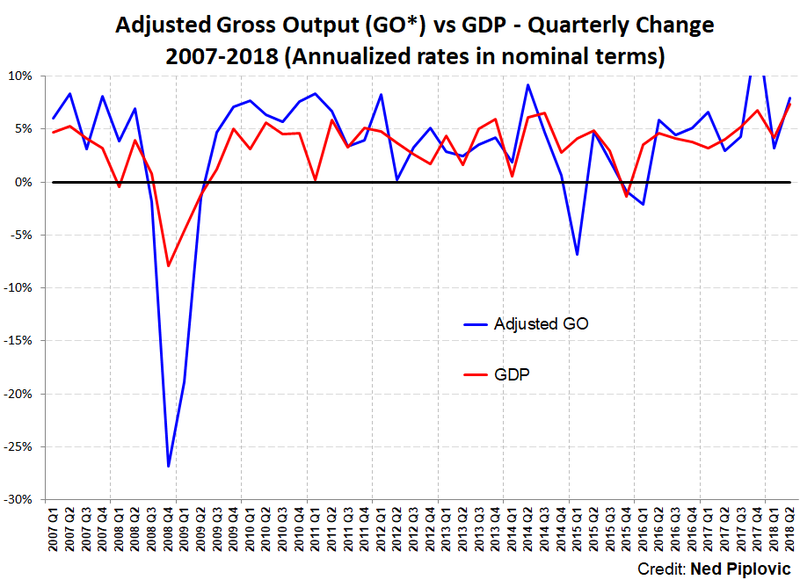 And so, GO looks at the whole economy from production to final output and show that investment is the big part of the economy, not consumption. Also, GO knocks government down to size. In terms of GDP, they say the more government spends the better the economy is. Ask the old Soviet Union how well that worked. The BEA – the Bureau of Economic Analysis – is finally beginning to recognize the value of GO. 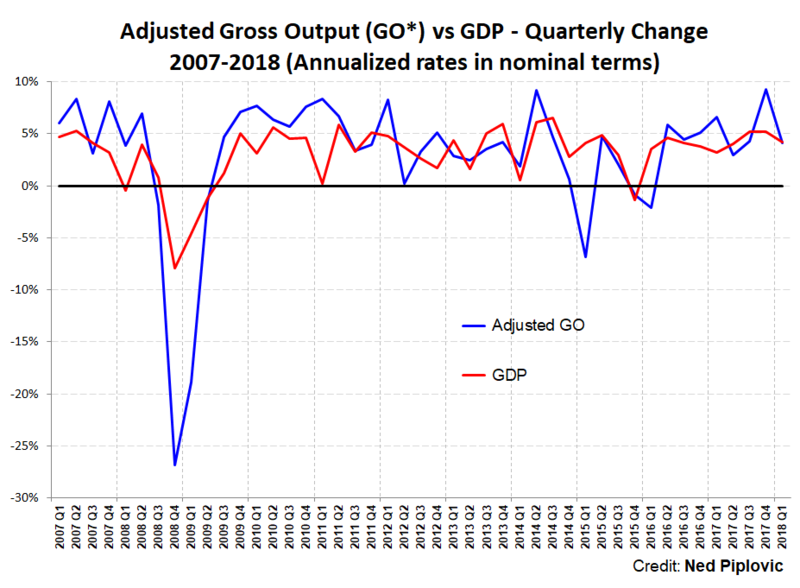 Right now, they come out months later after GDP. 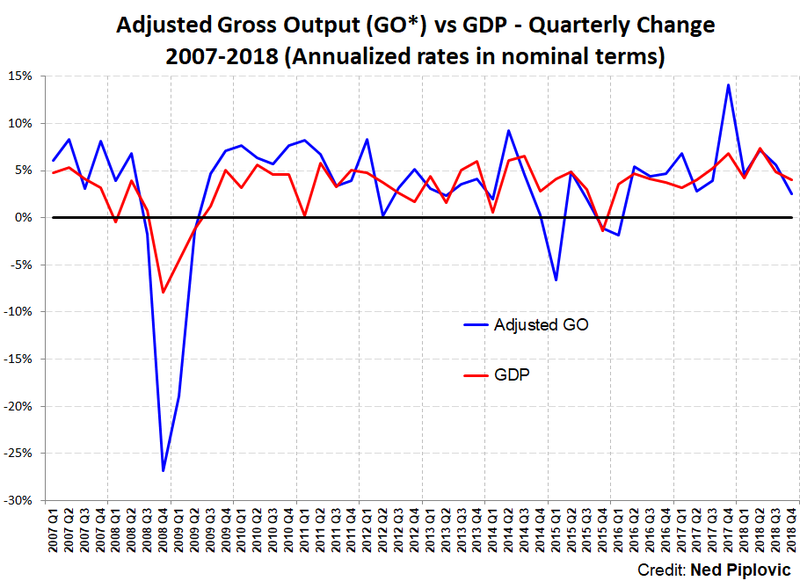 But thanks to Mark, it is now being published by the federal government, and eventually is going to replace GDP as a much more accurate picture, much more sensitive and full picture of what is actually happening in the economy. And I think it was late last year, we saw GO that the economy was beginning to pick up a real head of steam before GDP showed it. So, Mark is on to something with that. And so, without investment you get stagnation and turmoil. GO saves us from a profound misconception that if you just juice up spending, you get prosperity. The future belongs to GO. A hundred years from now, we will celebrate Mark’s contribution. Just as Billy Beane did in baseball (remember Moneyball? ), how this whole new set of statistic had people looking at baseball player performance in a whole new way. Now they’ve all adopted it. Soccer’s doing it, basketball is doing it. And Mark is doing it in economics – a whole new way starting to look at the economy and that way we get ideas shape on how we see the world. So enough of my verbiage. Mark has done many other things. He’s a great investor, he’s written great books on investing, he created FreedomFest. All tributes to his creativity. He also married Jo Ann, best thing he ever did, which is why we’re all here today. With that, Mark richly deserves this award, and this will be a dress rehearsal for a trip to Stockholm. He will be going there some day, or your heirs will to get the prize that he should have had, and some day will have. 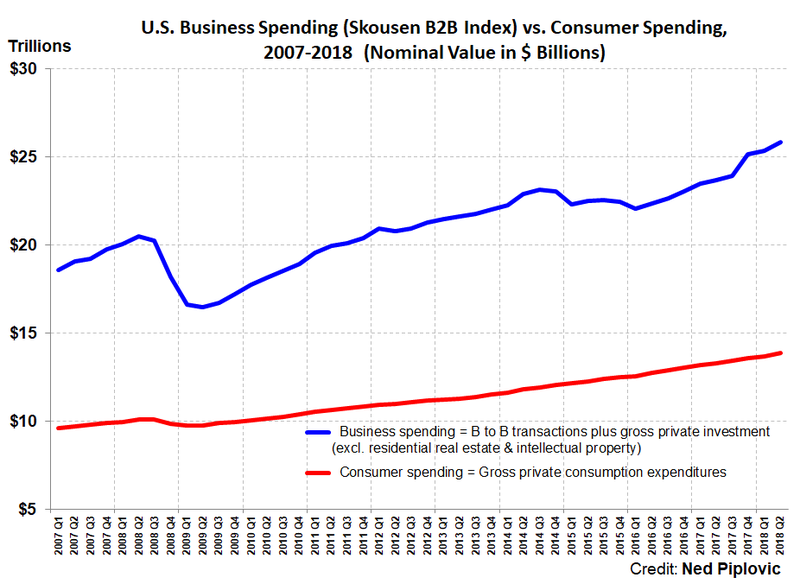 Revista Procesos de Mercado (Review of Market Processes) has just published Mark Skousen’s article, “Blocking Progress in Austrian Economics: A Rejoinder,” where he defends his work in gross output (GO) and responds to a recent critique by Walter Block. See http://www.jesushuertadesoto.com/revista-procesos-de-mercado/vol-xiv-no2-2017/, pp. 153-172.